London, UK. (November 8, 2012) – Windows Phone Parent celebrates its first year of “helping parents discover amazing Windows Phone apps” as their tagline endorses. The Windows Phone app review website emerged when a Windows Phone fan, a mother of two, tried to find high quality Windows Phone apps for her kids and herself in the Windows Phone App Store, which now contains almost 120,000 applications, but offers only basic app discovery features. Initially her idea was to simply catalog a few kid’s apps and to write app reviews once in a while, but the project has taken on a life of its own. In the past year, Windows Phone Parent has not only catalogued almost 200 family-friendly apps and published more than 50 app reviews, but has also launched Familia Windows Phone to promote Windows Phone apps to the 17 Spanish-speaking markets available in the Windows Phone App Store. They have also produced many promotional videos featuring animated characters made using Windows Phone applications, launched a beta version their app and gained more than 1000 followers across their various Social Networks. Sandra Sears, a user experience professional with a background in education and Co-founder of Windows Phone Parent, has collaborated with Windows Phone app developers from all over the world, providing feedback on how to improve their Windows Phone applications on the areas of usability, Metro design implementation and educational value. Many developers have benefited from Windows Phone Parent app promotion as well. Suzanne, a developer in the United States, reported a 66% increase in her app usage over a period of 70 days after her app was added to the Windows Phone Parent catalog. Rene, a developer in Germany, reported how his app downloads tripled for the week after his app was included in a seasonal app special that included a video promotion and a top-ten countdown list. On the eve of its first anniversary, Windows Phone Parent has officially launched its first two apps in the Windows Phone App Store: App Discovery by Windows Phone Parent andBuscador de App por Familia Windows Phone. Sandra and Patrick Sears, Windows Phone Parent founders, hope to provide an easier way for parents to find apps on the go, to expand their support to the development community in the English and Spanish speaking markets and to continue to be an integral part of the Windows Phone ecosystem as parents, fans and developers. Windows Phone Parent plans to release another discovery app just for kids in the near future. The app, designed around the new Windows Phone 8 Kid’s Corner, will aim to enable children to safely find their own apps and allow parents to set up filters on the types of app suggested to their kids based on their age and interests. For more information about WindowsPhoneParent.com, visit their website (http://www.windowsphoneparent.com ), like them on Facebook (http://www.facebook.com/WindowsPhoneParent), follow them on Twitter (http://twitter.com/WPParent ), or email them at info@windowsphoneparent.com. Windows Phone Parent was conceived in September 2011 by Sandra and Patrick Sears, a couple with a technology and education background, with the goal of assisting parents in finding quality entertainment and education apps on their Windows Phone. Originally envisioned as a simple website with a limited number of app reviews, the project has expanded into a comprehensive app catalog featured on the web, social networks and WP apps for English- and Spanish-speaking markets. Windows Phone Parent hopes to raise the bar with regard to developing Windows Phone applications for children and parents and to give a voice to parents in their development. The Windows Phone Parent website was officially launched on November 8, 2011, and its app was officially launched a year later on November 8, 2012. Microsoft has officially launched Windows Phone 8 but yet we still haven’t heard a word about Windows Phone 7.8. Current Windows Phone devices will not be upgraded to the latest and greatest Windows Phone 8 but will et some features under 7.8. Today however, Nokia China put up a “Lumia Experience Store” in Shanghai that included a bunch of Lumia phones to try out (even a MS Surface). 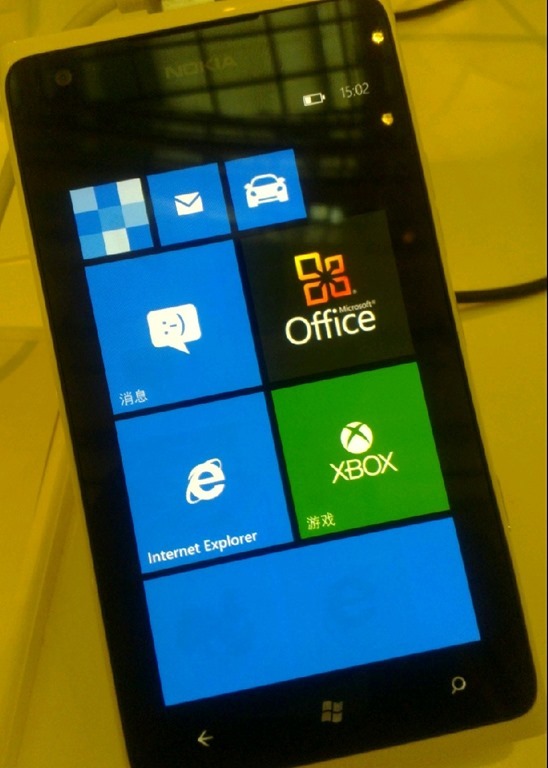 The big surprise however was that Nokia China also had a Lumia 900 running Windows Phone 7.8. Nothin new was revealed however except for the new start screen. This is the only Windows Phone 7.8 related news we have heard from Microsoft or Noikia since it was first announced months ago aside from Microsoft Italy posting a bit of information a few days back. Nokia is planning an event next Monday to launch its new Lumia Windows Phone 8 handsets in the Gulf market. According to an article in the popular Saudi Arabia newspaper Alriyadh, the manufacturer is expected to price the new hardware at no more than SR2300 ($613), which was revealed during GITEX Dubai last week. Said markets include Saudi Arabia, Bahrain, Kuwait, Oman, Qatar, United Arab Emirates, Jordan and Morocco. 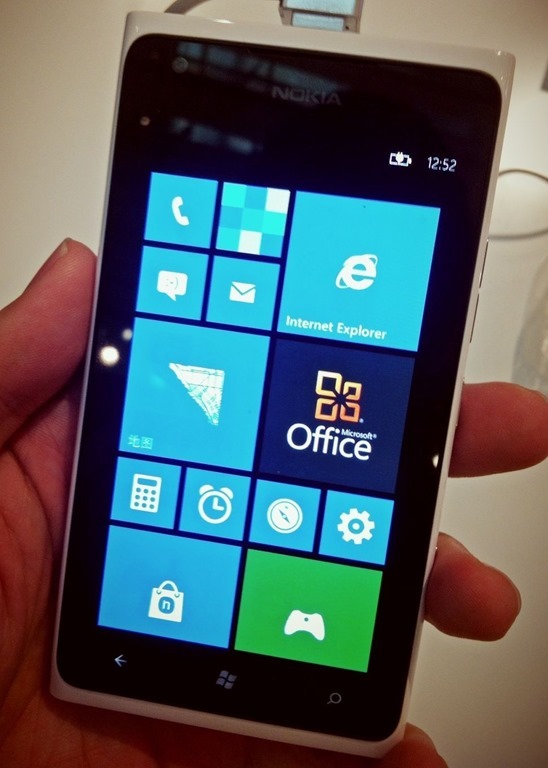 Both the Lumia 920 and Lumia 820 are still yet to launch in major markets, including the US, China and Europe. Nokia is set to push strong in more markets, and the Gulf is certainly a strong step in the right direction for Windows Phone. Not sure if this is a sign of things to come (we can only hope) but the local Best Buy in Naples, Florida is displaying pricing points for the AT&T Nokia Lumia 920. It matches up with the rumors we reported a few days ago with the two year contractual/upgrade price running $149.99. The out of contract price is listed as $599.99 which seems about right for retail. Our tipster reported that there weren’t any demo units of the Lumia 920 out and the sales clerks had not idea on availability. Hopefully, the November 9th part of the rumors will hold true and we’ll start seeing the new Nokia Windows Phones on shelves this weekend. AT&T announced today that it will be offering the Samsung ATIV Smart PC on November 9th for $799.99. AT&T* and Samsung Telecommunications America, LLC (Samsung Mobile)2, today announced availability of the Samsung ATIV smart PC, a new tablet designed for the new Windows® 8 operating system, and the Samsung Galaxy Tab® 2 10.1, a 4G LTE Android tablet. Both tablets will be available for AT&T customers this holiday season beginning Nov. 9. The Samsung ATIV smart PC will be priced at $799.99 and the Galaxy Tab 2 10.1 will be available for $499.99. AT&T is giving customers more reasons to purchase a Samsung device this holiday season as part of a limited time offer that gives customers up to $100 off the purchase of any connected Samsung device of lesser or equal value, including the new Samsung ATIV smart PC and Galaxy Tab 2 10.1, when they purchase any Samsung Galaxy smartphone (w/ two-year agreement incl. qualifying voice and data plans). Samsung ATIV smart PC combines premium computing power in an elegant tablet form factor while providing AT&T customers the ultimate in productivity and entertainment features. The powerful ATIV smart PC has an 11.6-inch HD PLS display, 64GB of internal storage memory and a microSD card slot to support up to an additional 32GB of memory and the Intel® Atom™ dual-core processor, up to 1.5 GHz. ATIV smart PC comes installed with Windows 8 (which can be upgraded to Windows 8 Pro). It is also backward compatible and supports all existing software and applications that run on older windows OS such as Windows 7, Vista, and XP. ATIV smart PC also comes preloaded with a trial version of Microsoft Office 2010 for a complete PC experience and for productivity while on-the-go. ATIV is Samsung’s brand for Windows 8 products including Smart PCs, tablets and Windows Phone 8 for smartphones. Samsung will continue to announce ATIV products to provide advanced, productive and creative experiences. Stand Dock – Dock the ATIV smart PC in the Stand Dock to turn any environment into a personal office. In addition to providing a charge when docked, the Stand Dock is equipped with a built-in USB port and Ethernet (RJ45) port to connect the ATIV smart PC to LAN and various USB peripherals. VGA Adapter – Expand your workstation and give presentations with ease with the VGA Adapter (micro HDMI to VGA connectivity). Use the VGA Adapter to connect the ATIV smart PC to external displays, monitors and projectors for second-screen viewing and enhanced productivity. Additional accessories will also be available. Beginning in late November online at www.wireless.att.com, the ATIV smart PC Stand Dock will be available for $49.00 and the VGA adapter will be available for $40.00. The Samsung Galaxy Tab 2 10.14 is a 4G LTE Android 4.0 tablet that delivers entertainment and productivity to fit your whole life. Galaxy Tab 2 10.1 offers a 10.1-inch display and premium entertainment options including Media Hub, Smart Remote and AllShare® Play. 3 Features like on-device encryption and VPN access ensure the tablet is secure for business use, while the 7000 mAh battery allows for all-day connectivity. For more information on Samsung Galaxy Tab 2 10.1, please visit www.att.com/galaxytab2. AT&T customers have access to the nation’s largest 4G network, covering 285 million people. AT&T has two 4G networks that work together for customers, LTE and HSPA+ with enhanced backhaul. That means AT&T customers are able to enjoy a widespread, ultra-fast and consistent 4G experience on their compatible device as they move in and out of LTE areas.5 With other carriers, when you travel outside of their LTE coverage area, you may be on a much slower 3G network. Beginning Nov. 9, Samsung ATIV smart PC and Galaxy Tab 2 10.1 will be available in AT&T company-owned retail stores nationwide and online at www.wireless.att.com.